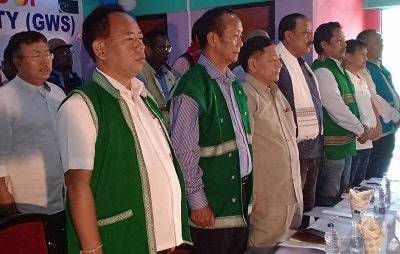 The Mising Bane Kebang (MBK) and Galo Welfare Society (GWS) on Saturday inked a historic peace agreement – Likabali Declaration – for curbing conflicts and tensions along the Assam-Arunachal Pradesh border. The peace deal inked at Likabali along the border between the apex body of the two communities involved the Galos of Lower Siang district and Misings of Dhemaji district of Assam living along the inter-state boundary. Based on the fact that both the Mising and Galo communities share a common ancestor, the Likabali Declaration has as its first point an agreement between MBK and GWS to constitute Galo-Mising Co-ordination Committee (GMCC). The GMCC with its own president and general secretary on rotation basis would sort out any dispute between individuals of both communities residing along the inter-state boundaries. Any settlement of disputes would be done through dialogue and without or minimal interference from the administration. That aside, GMCC would also act as the medium for promoting brotherhood, cultural exchanges, facilitate pan-festival celebration of Ali Aye Ligang and Mopin, promote trade and commerce along the inter-state boundary, and facilitate the formation of a research and development committee to explore and propagate the rich cultural and ancestral history of the two communities. Another significant point in the Likabali Declaration was the agreement between the representatives of the two communities to mutually recognise and respect the possession rights over land and property. Both the sides agreed that there would be no act of trespass or encroachment henceforth. The Likabali Declaration also called for GWS and MBK to uphold the decisions taken in the meeting at Gogamukh on June 13, wherein it was agreed that both organisations would come to the aid of each other’s community members and protect one another from prejudice and discrimination in their respective areas of authority. The GWS was represented by its president Dr Mitum Boje and general secretary Dr Minge Loyi, while the MBK was represented by its president Paramananda Chayengia (also Chief Executive Councillor of Mising Autonomous Council) and general secretary Raju Medok. The Likabali Declaration also attained political significance and approval with endorsement from the elected lawmakers of both side – Jonai MLA Bhuban Pegu for MBK and Nari-Koyu MLA Kento Rina and Likabali MLA Kardo Nyicyor for the GWS. Endorsing the move by GWS and MBK, the lawmaker trio in their speeches hoped that the coming together of the two communities in pursuit of peaceful co-existence would set a positive trend and become a model for all others to emulate. To commemorate the day, the legislators and executive members of GWS and MBK later planted saplings in the premises of the Likabali Government Higher Secondary School auditorium. Saturday’s meeting was in continuation of the peace effort initiated at Dirpai, Gogamukh on June 13 after a minor skirmish between the Galos of Hime village and Misings of Dirpai on June 7, 2018. Several prominent public leaders along with general masses from both communities attended the day’s meeting in huge numbers.